Li'l Cinders, originally known as Lava Bubbles, are enemies in Super Mario Galaxy. Their name directly references cinders, which are small parts of any highly combustible material. They have an ice counterpart called Li'l Brrs. Li'l Cinders spawn from lava pools, though sometimes they are encountered above land. They slowly chase Mario upon spotting him and attempt to ram into him to inflict damage. If Mario touches a Li'l Cinder, he catches fire and starts running around uncontrollably while losing a wedge of his health meter. 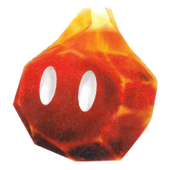 Mario can use a spin attack nearby or shoot a Star Bit to put out the flame surrounding a Li'l Cinder, making it fall on the ground vulnerable. In this state, the enemy will attempt to escape Mario by hopping away and seek a pool of lava to regenerate its flame. However, in its cold state, the Li'l Cinder can be kicked or jumped on to destroy it, producing a coin. Li'l Cinders are found in Freezeflame Galaxy and Melty Molten Galaxy. They return in Super Mario Galaxy 2 where they behave the same as in the previous game. They can also be spawned by Magikoopas. If Mario rolls a snowball into a Li'l Cinder, he instantly defeats it. They appear in the Freezy Flake Galaxy, Battle Belt Galaxy and Mario Squared Galaxy. Although the Li'l Brrs have a boss variant, the Li'l Cinders do not. ↑ Black, Fletcher. Super Mario Galaxy PRIMA Official Game Guide. Pages 185, 280-285, 287, 290-292. This page was last edited on March 18, 2019, at 20:56.